Happy Thursday everyone! 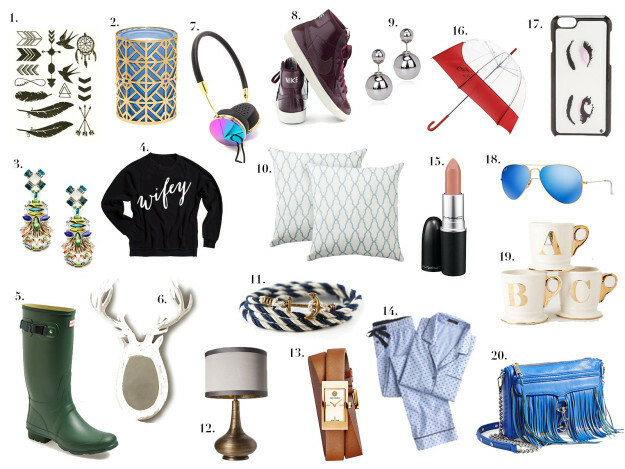 Today’s post is all about holiday gift ideas. Thanksgiving is already behind us and Hanukkah is just around the corner, every year I try and get something for the people I love. I usually walk around differnt shops and pick up cute little thing I think a friend or family member would love. it dosen’t need to have a high price tag to make someone you love happy! This ‘Holiday Gift Guide’ is filled with small cute gifts at different price points. 1. You might want to try out the temporary tatto trend we’ve been seeing all over. 2. I have a thing for candals. 3. For that girl who loves a statement piece. 4. How cute is this “wifey” sweatshirt?! 6. For the animal enthusiast. 7. Adds a personal and stylish touch to ordinary headphones. 10. A touch of print to your living room. 11. Anchor yourself to that person you love. 12. Gold touches around the house. 13. This piece can be worn casually or dressed up. 14. Now is the perfect time for new fluffy, cozzy jammies. 15. Another lipstick to your collection is always a good idea. 16. A playfull umbrella to brighten up a gloomy rainy day. 17. It is fun to change up your phone case every now and then. 18. I love the cold blue lense tone for the winter months. 19. Imagine how much better hot chocolat milk tastes in these mugs. 20. A must have fringe bag. I hope you find something for everyone on your list (including yourself ;)! Have great weekend & thanks for stopping by!